The DOLLARDE Function is a Financial functionFunctionsList of the most important Excel functions for financial analysts. This cheat sheet covers 100s of functions that are critical to know as an Excel analyst. It helps in converting a dollar value in fractional notation into a dollar value expressed in decimal notation. DOLLARDE will divide the fraction part of the value by an integer specified by the user. It is used in pricing US treasury bonds quotes, which are priced to the nearest 1/32 of a dollar. Learn more from the New York Fed. The function is very useful for financial analystsFinancial Analyst Job DescriptionSee a real Financial Analyst Job Description including all the skills, experience, and education required to be the successful candidate for the job. Perform financial forecasting, reporting, and operational metrics tracking, analyze financial data, create financial models when doing financial reportsThree Financial StatementsThe three financial statements are the income statement, the balance sheet, and the statement of cash flows. These three core statements are intricately linked to each other and this guide will explain how they all fit together. By following the steps below you'll be able to connect the three statements on your own. using stock market quotes, as fractional dollars are used for security prices. DOLLARDE is available from MS Excel 2007. Fractional_dollar (required argument) – It is the number expressed as an integer part and a fraction part, separated by a decimal point. Fraction (required argument) – It is the integer to be used in the denominator of a fraction. We need to provide it as an integer but in case of a decimal value, Excel will truncate it to an integer. The function will divide the fraction part of the value by an integer. For example, if we want the security’s price to be expressed to a precision of 1/16 of a dollar, we divide the fraction part by 16. In this case, 1.2 represents $2.25 ($1 + 2/16 = $2.25). 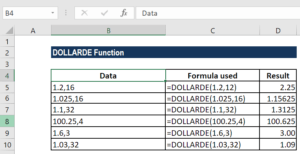 How to use DOLLARDE Function in Excel? 1.2,16 =DOLLARDE(1.2,16) Converts the decimal number 1.2, read as 1 and 20/16. As the fraction value is 16, the price has a precision of 1/16 of a dollar. 1.025,16 =DOLLARDE(1.025,16) Converts the decimal number 1.025, read as 1 and 2.5/16. As the fraction value is 16, the price has a precision of 1/16 of a dollar. 1.1,32 =DOLLARDE(1.1,32) Converts 1.1, read as 1 and 10/32, to a decimal number (1.3125). As the fraction value is 32, the price has a precision of 1/32 of a dollar. 100.25,4 =DOLLARDE(100.25,4) Converts 100.25, read as 100 and 1/4, to a decimal number (100.625). As the fraction value is 4, the price has a precision of 1/4 of a dollar. 1.6,3 =DOLLARDE(1.6,3) Converts 1.6, read as 1 and 2/3, to a decimal number. As the fraction value is 3, the price has a precision of 1/3 of a dollar. 1.03,32 =DOLLARDE(1.03,32) Converts 1.03, read as 1 and 1/32, to a decimal number. As the fraction value is 32, the price has a precision of 1/32 of a dollar. If the fraction given is not an integer, it will be truncated. #NUM! error – Occurs when the fraction is less than zero. #DIV/0 error – Occurs when the fraction given is zero. The DOLLARDE function is useful for converting values that are given as 16¼ to the decimal and use them in other calculations or charts. The function accepts a reference to a cell, so we can provide the arguments in a different cell and refer to them in the DOLLARDE formula. For users using MS Excel 2003, remember that the function is only available when the Analysis ToolPak add-in is loaded.